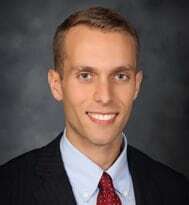 Attorney Joseph Canepa was born in Lake Ronkonkoma, New York, and received his Bachelor of Arts in philosophy, politics, and law from the State University of New York at Binghamton in 2009. Joseph then went on to study law at SUNY Buffalo Law School with a concentration in criminal law. He received his Juris Doctor in 2012. Admitted to practice law in New York State and the U.S. District Court for the Western District of New York, Joseph is a member of the American Bar Association, New York State Bar Association, and the Bar Association of Erie County. He also serves as the alumni advisor for the Alden Chapter of Phi Alpha Delta Law Fraternity and volunteers for Compeer, Inc., a nonprofit that helps people overcome mental illness. In his spare time, Joseph enjoys weight training, playing guitar, reading, and hiking.